McQueen Rd. and Ocotillo Rd. Multi-use park on a former land fill site. 11 holes have dual tees and 1 hole has 2 baskets. Mostly wide open with some OB. Features 2 concrete culvert mandos through pipe. Multiple berms and a couple of blind tee shots. Good length variety and decent elevation. From Phoenix; 1-10 south to east bound 202 loop (San Tan Freeway), McQueen exit. Go south past Queen Creek to park entrance before Ocotillo on the right. 1st tee to south of playground. Great course, I wish I had found it sooner. It was underestimated by me when I got there but the course proved challenging enough for someone new to the sport, I even met a guy who said he had played there alot and still gets thrown off by that 615 footer. I would have given the course a 5 but it is not in the pines of Flagstaff where I initially got hooked on the game. Nice, new course for a casual round. Windy days will provide more of a challenge. 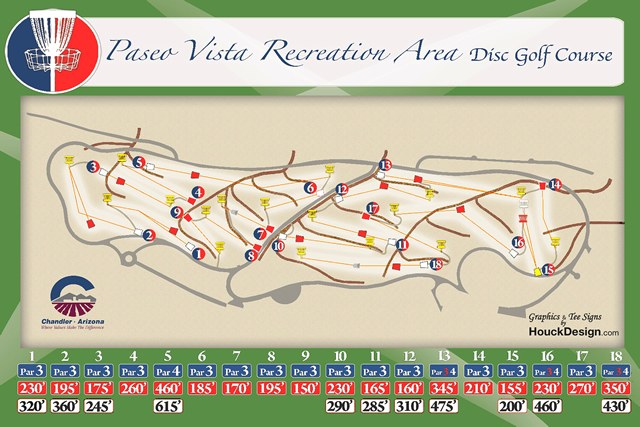 Interesting course that can be punishing on discs. Watch for pedestrians/kids and enjoy the mandos. Crisp, Clean and great for beginners and pros alike! Brand spankin' new course with 18 new beautiful baskets, tee pads and great signage. Good course for beginners because it is wide open for the most part and short. 12 or so of the holes are less than 300 feet, but if you are a seasoned veteran there are many things you can do to up the anti. Huge cement tubes on 2 holes can play as mando's and many trail boundries can be declared OB to make any short hole more challenging. This course is technical if you want it to be but can also give a pretty, under-par score that's sure to brighten anyone's day. This course is a bright spot on the map for anyone in the Mesa/Chandler area that wants to work on their short game and get in a few hucks on the 4 long holes.